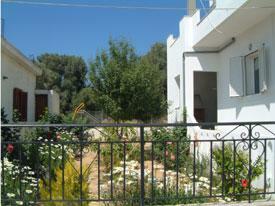 The Cretan-German couple Koundouraki-Zahner and their 2 children are pleased to welcome you from 07/01/2005 in their new built studios or apartment. Each of the two studios (see the plan, pict.) 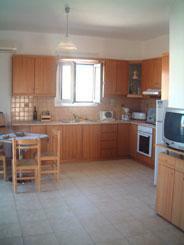 has the following facilities: full equipped kitchen, living room, bath (shower/WC), Sat-TV and airconditioning. 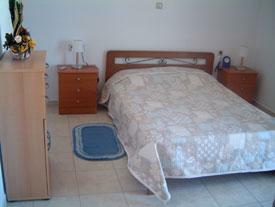 The seperated bedroom and the living room have place for four persons.The flats have all balcony or terrace. Babybeds and babychairs we offer as well. The garden with sun-shades and loungers and barbecu is available to our guests anytime. Also the breakfast can be taken there. Especially for children we made a playground with swings, a slide, a basket, a trampolin and a small soccer-goal. bath (shower/WC), a kitchenette with dining area and lounge, doublebed, TV-Sat, airconditioning and a sunny, commun roof terrace . It's possible to rent the apartment and studios all over the year. Who wants to enjoy the mild climate in winter ask us for the special long-term-prices.